The second of two-part series on AP Art History (see the first part here), this week’s post examines the revised APAH curriculum that will go into effect later this year, its intended outcomes, and its relevance to art historians at all educational levels. We also identify new resources developed specifically for the new APAH curriculum, as well as others that are appropriate for both secondary and university-level instruction in art history. In 2013, the College Board released a curricular framework for AP Art History. This was the first step in preparing teachers for the redesigned course and exam that will take effect in 2015-2016. The revisions follow a three-year process that sought input from instructors and advisors at both K-12 and university levels, and that aims to foster more critical analysis of works of art and awareness of global artistic traditions. The reasons for the redesign reflect concerns heard at all levels of art historical instruction. Like many of us who teach art history, AP instructors must balance extensive course content with the need for students to learn fundamental skills and concepts of the discipline. In the past, uncertainty about which objects might appear on the AP exam increased pressure on teachers to cover a broad range of material without great depth. This problem was compounded by the fact that most AP teachers have backgrounds in studio art, social studies, and language arts, so advanced training in art history itself remains outside of their areas of expertise. In order to address these issues, the curricular framework states learning objectives that reflect college-level proficiency in art historical skills and concepts, and defines specific content areas that focus on a reduced number of required objects for study. These are organized chronologically in geographic groupings to encourage a global approach to the material. For example, “Global Prehistory” includes works of art from China, Lascaux, New Guinea, and Central Mexico that date between 30,000 and 500 B.C.E., and “Global Contemporary: 1980-present” looks at artists ranging from Christo and Maya Lin to El Anatsui and Wangechi Mutu. More traditionally structured areas like “Early Europe and Colonial Americas (200-1750 C.E. ),” “Later Europe and Americas (1750-1980),” and “West and Central Asia (500 B.C.E.-1980 C.E),” also reflect a global perspective by integrating examples of Islamic, Buddhist, or Christian art based on geography and time period rather than culture alone. The most notable change in the curriculum has been to limit the number of objects students must know in some detail for the exam. This set of 250 key objects, which draw from a variety of artistic media, traditions, and functional roles, serve as examples through which students learn foundational concepts and skills they can then apply to other works of art from different regions and periods. These curricular revisions aim toward a broader goal to have teachers employ more active learning methods to teach art history. A common concern among many AP instructors is that they lack expertise in world art historical content–a problem exacerbated by the global perspective of the new curriculum. The College Board insists they don’t want high school teachers to be authoritative experts who lecture about art’s importance, but rather to recognize pedagogical value in modeling skills of art historical research, visual analysis, and the application of knowledge for their students. Teachers should recognize that narrowing the focus to 250 exemplars allows them to incorporate more works of their own choosing. The new curriculum’s greater emphasis on skills of analysis and interpretation benefits from comparison of the exemplars to other works of art in terms of cultural context, historical function, and formal treatment. Moreover, while many of the works chosen are familiar (David, Oath of the Horatii, 1785), there are a number of lesser known works (Miguel Cabrera, Portrait of Sor Juana Inés de la Cruz, c.1750) not included in most art history textbooks. This demands teachers and students look beyond a single source for information–an expectation codified in the College Board’s stipulation that APAH course syllabi include assignments that have students consult primary and secondary sources beyond a required text. The changes to AP Art History address valid concerns about the lack of academic depth and emphasis on rote memorization that critics of the Advanced Placement program expressed in the past. Similar criticisms have been leveled against introductory art history surveys in higher education for many years. The work the College Board has done, guided by scholars in art history and experienced educators in K-12 learning, might offer a model for undergraduate courses looking at alternatives to traditional approaches to the survey. The strength of the new APAH curriculum is in its emphasis on active learning, attention to research and skill-building, and the reliance on a limited core of objects to teach key art historical concepts and essential ideas in globally defined content areas. Additionally, its clearly defined learning objectives help educators apply backward design principles in developing assessments that can measure and improve students’ understanding of course content. This pedagogical approach to assessment is not familiar to most instructors at the university level, but is becoming essential as more administrators and policy makers demand evidence of course impact on student learning. In last week’s post on this topic, we argued that AP Art History is important to the future of art history. Its presence in high schools–small though it is– ensures the discipline’s visibility within K-12 as a distinct field of humanistic inquiry. Ironically, the limited scope of AP Art History undermines its potential impact. The common attitude among many publishers and museums is that serving such a small number of students doesn’t merit the resources required for special programs or materials. For academic art historians, AP Art History often falls off the radar, except when faced with questions about assigning students credit. But until art history becomes standard in secondary education, its exposure through AP courses remains a necessary first step in demonstrating the value of art historical study and challenging popular misperceptions of art history as irrelevant and impractical in the world today. While some museums once offered AP Art History courses on site, few now have resources linked specifically to the APAH curriculum. The revised framework, which requires students engage with primary art objects, suggests opportunities for collaboration between museum educators and AP teachers beyond traditional gallery tours. For most museums, this means pointing teachers and students to works in their own collections that reinforce APAH course content or invite comparison to the core 250, thus allowing students to deepen their learning and apply their knowledge. For larger institutions that own objects in the required 250, simply flagging these works like MoMA has done as part of the AP curriculum, and linking them to related objects and informational resources would be beneficial. 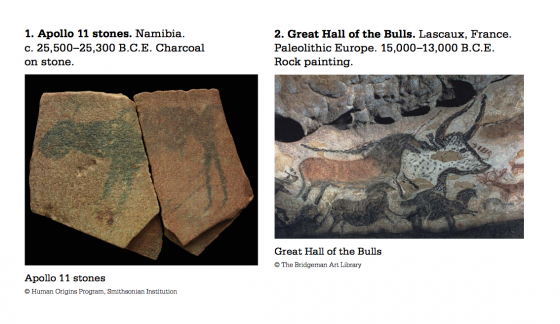 Additionally, museums could help teachers facilitate student research projects. The new APAH curriculum builds on a pedagogical framework of “Big Ideas” and “Essential Questions” that is common in museum education. (See pp 9-18 of the AP Art History Course Exam and Description found here.) Museum educators use these concepts to emphasize the process of meaning-making through close looking, visual analysis, and layering information. These skills are important to object-centered learning, and serve as the foundation for art historical study involving systematic inquiry, research, and analysis, which is required by the new curriculum. Museums could support these advanced learning objectives by providing AP teachers strategies for students to use online collections and archival resources for primary source research. Although not aligned with the AP curriculum, the National Gallery of Art’s High School Seminar 2.0 serves as a model that addresses higher level skills. This ten-session program is aimed at serious art students, and requires participants conduct independent research, complete writing assignments, and present findings on a thematic topic based on works in the collection. Skill-building is also the goal of the NGA’s two-hour Advanced AP Art History workshop, which targets students in AP and International Baccalaureate programs. In addition to object-centered discussions, students work from original works of art in the galleries to hone their essay writing abilities. AP Art History Teachers can also benefit from professional development opportunities that many museums already provide. Museum educators experiment with a variety of active learning techniques designed to support multiple learning styles and enhance students’ understanding of concepts learned in the galleries. The Museum of Modern Art offers two Coursera MOOCs that are available on demand Art and Inquiry: Museum Teaching for Your Classroom and Art and Activity: Interactive Strategies for Engaging with Art. Many museum educators have commented that they hope this post will open up a dialogue with AP Art History teachers in their communities. We encourage teachers to reach out to their local museums, and work with them to identify new models and learning strategies that can be shared with others. Because high school teachers do not always have access to the well-vetted resources found in college libraries, this list includes resources specific to the APAH curriculum as well as others that may be appropriate for both secondary and university-level instruction in art history. Editors Note: The resources below are described without commentary or critical review. Anyone interested in submitting reviews of these materials to AHTR should contact virginia.spivey@gmail.com. Because many objects in the new curriculum are held by institutions that contribute to the Artstor Digital Library, a non-profit subscription-based resource, Artstor is compiling materials on these objects in the new curriculum in its AP Art History Teaching Resources. This ongoing project is led by Dana Howard (co-author), an experienced AP Art History teacher, hired by Artstor in 2013 to better meet the needs of the K-12 school community. Organized by APAH content area, Artstor groups objects in folders that combine images with descriptions providing art historical analysis of the object’s context and meaning. Understanding that the College Board stipulates that a variety of primary and secondary sources be used by both students and teachers, Artstor has embedded links to specific pages of online historical archives, museums, artists’ websites, and trusted content providers such as Smarthistory at the Khan Academy at the end of each entry. Additional folders offer image groups with related works of art, also with detailed descriptions and external links, for comparison and contrast to the required object. While general overview groups are complete for the entire curriculum, the more elaborate materials with compare and contrast sections are still being written. Much of the first five content areas are nearing completion, so teachers can begin using the resource in course planning. Artstor’s AP Art History Teaching Resources are available to faculty, staff, and students at all subscribing institutions. Users can also make use of the site’s features such as high resolution images that can be zoomed in for detail and downloaded with complete metadata. Because image groups can be copied, edited, and saved to individual or school’s folders, teachers can use them as building blocks for customized assignments. Students can access assignments using a computer or a mobile device through an LMS or directly from the Artstor Digital Library. The College Board has a dedicated web page for the course redesign. There, teachers can find the full course and exam description, which includes the Curriculum Framework, planning and pacing guides, and the latest announcements about professional development opportunities. In addition, the College Board has a page dedicated to helping teachers prepare a syllabus that will meet the requirements for the course audit. The course audit guides teachers in creating a curriculum that reflects the college-level expectations of the Curriculum Framework. Smarthistory at the Khan Academy is working to provide free test preparation for the new Art History AP curriculum.These materials include short videos, essays, and online quizzes, developed by Beth Harris and Steven Zucker, founders of Smarthistory.org and now Deans at the Khan Academy, along with other art historians and curators with expertise in each content area. The Smarthistory format has become familiar to many art history teachers and popular for its engaging presentation of quality academic content. Since joining the Khan Academy in 2011, Smarthistory’s content has expanded significantly to include resources from museum partners such as the British Museum, the Metropolitan Museum of Art, and San Francisco’s Asian Art Museum, and a broader range of art historical topics from expert contributors. A recent grant from the Andrew W. Mellon Foundation will allow Smarthistory at Khan Academy to accelerate content creation and focus on creating a truly global art history. The AP Art History resources currently appear in a specially designated “Test Prep” area. 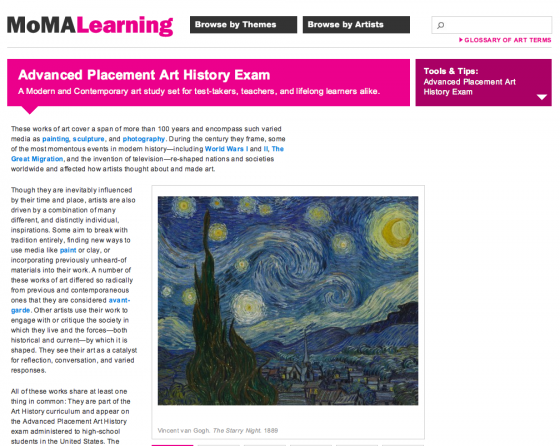 Although separate from other art historical and museum partner content on the Khan Academy website, these are comparable learning resources, not simply tricks to improve a score. Objects are grouped according to APAH content areas, with additional components that offer general introductions to the study of art history, and the different cultures and religions included in the curriculum. Materials currently exist for the majority of the 250 objects required by the APAH curriculum. The goal is to have content (videos or essays and links to external resources for each object) available for each object in the new curriculum by August 2015 and additional content will continue to be added. More quizzes will also be developed to test student knowledge of key ideas. Based on a self-paced model of learning, the Khan Academy site allows students to track their own progress–they receive badges and accumulate reward points for completion of each resource. Teachers who want to assign this content can also create a course designation where students can enroll, allowing teachers to monitor individual student’s work through a dashboard similar to an LMS platform. Published by Thames and Hudson, Gateways to Art: Understanding the Visual Arts (AP Edition) is the only textbook directed toward AP Art History courses. This text is an adaptation of an existing introductory visual arts textbook that has been bundled with supplemental materials developed for the new APAH curriculum. Written by authors with expertise in teaching art history, art appreciation, and studio practice, the book is structured around four topics: Fundamentals, Media, History, and Themes. While the text does not feature all of the required 250 objects, Thames and Hudson plans to develop an online Global Gallery that will provide teachers who adopt the textbook free access to high resolution images of the required objects in jpeg and powerpoint formats. Instructors will also receive a Pacing Guide at no extra charge. Developed by an experienced AP Art History teacher, the Pacing Guide offers recommendations around time needed for each topic, lesson alignment to learning objectives, and background information on images not discussed in the text. Each chapter includes class exercises, research assignments, and Concept Maps that compare and contrast works. A College Instructor’s Resource Folder is available upon the teacher’s request. While not AP-specific, this folder contains DVDs of thirty-five 7-10 minute videos, created for Thames and Hudson, which provide content on objects, media, and techniques, along with 51 interactive exercises that underscore visual concepts for students. Jstor’s Register and Read Program is a free service that allows individual to register and read up to three articles at a time. Since the College Board expects students and teachers to access scholarly resources beyond the textbook, this service can be especially helpful (albeit limited). The Metropolitan Museum’s Heilbrunn TImeline of Art History is a well-known resource used by higher education faculty. It contains substantive thematic essays on a period, culture, or a specific work of art, along with related images and bibliographic links. 82nd & 5th is another offering from the Metropolitan Museum that can be helpful for students and teachers working to make thematic connections across the APAH curriculum. Art Through Time: A Global View can be a helpful site for addressing cross-cultural and thematic connections with students. The Art Story is designed to present Modern Art in a more accessible and understandable manner. Art21 features an extensive range of materials on contemporary art, including interviews with many artists represented in the Global Contemporary area of the APAH curriculum. Special thanks to Wendy Free (The College Board), Allegra Smith and Deb Howes (MoMA), Elisa Patterson (NGA), Nicole Albas (Thames & Hudson), and Beth Harris and Steven Zucker (Smarthistory at the Khan Academy) for their contributions to this report.